H. R. Harmer's auction sale number 3000, which was held in Costa Mesa, California on October 27-29, 2011, included the 2915A "Split Nines" PS8 Strip as the auction lot number 2238. (https://ssl.hrharmer.com/Auctions/AuctionLot.aspx?LotID=273624) This strip was estimated by them to sell between $1500.00 and $2000.00, which was right on, because it then sold for a record setting $1888.00, which included buyer's commission. The lot was set at $800.00 for the opening bid and rapidly shot up past $1200 in the "Pre Auction Sale" online, with a couple of more bids coming in until the live auction was held on October 28th. Several floor bidders pushed the price to $1600.00 for the hammer, producing he final sale price at $1888.00 establishing a record price for this strip. The actual value of this strip has always been a controversy in and around the PNC community. It's valued by Scott's at $1500.00, which I always believed was way undervalued for their catalog. A few years back I sold one privately for $1900.00 (before the economy tanked). In the PNC3 club's values guide, this strip is valued at a more realistic price of $2000.00. 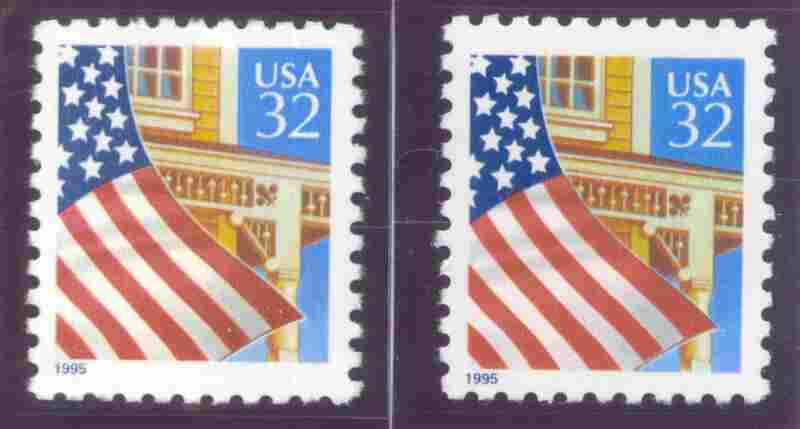 On my website in the "Price Guide" for the Flag Over Porch stamps the value was listed at $2500.00. This price being a little high, I wanted to see what the strip would bring at auction. I have now changed the FOP price online to $2000.00 to match the PNC3 listing. USPS maintains that the thicker paper is with the original release of the 2897, with plate number S11111. However after almost a year of discussing this with several informed collectors, we have come to the conclusion that the thicker paper is actually the reprint, with plate number S22222. Thank You. Scott's 2897 Flag over Porch comes in two formats. These are with low gloss gum (Figure 1), printed with Plate Number S11111, and with shiny gum (Figure 2) reprinted with Plate Number S22222. These two varieties were considered indistinguishable in postally used condition until 2005. However, there are several noteworthy features on these stamps, identifying them into two distinct varieties. The most noticeable difference is in the clarity of the two stamps. The shiny gum variety, (Figure 4) has a much crisper image of the stars, and a smoother solid blue background of the flags ensign. In the low gloss gum variety, (Figure 3) the stars have a more hazy look to them, with the blue background having a "molted" looking effect. 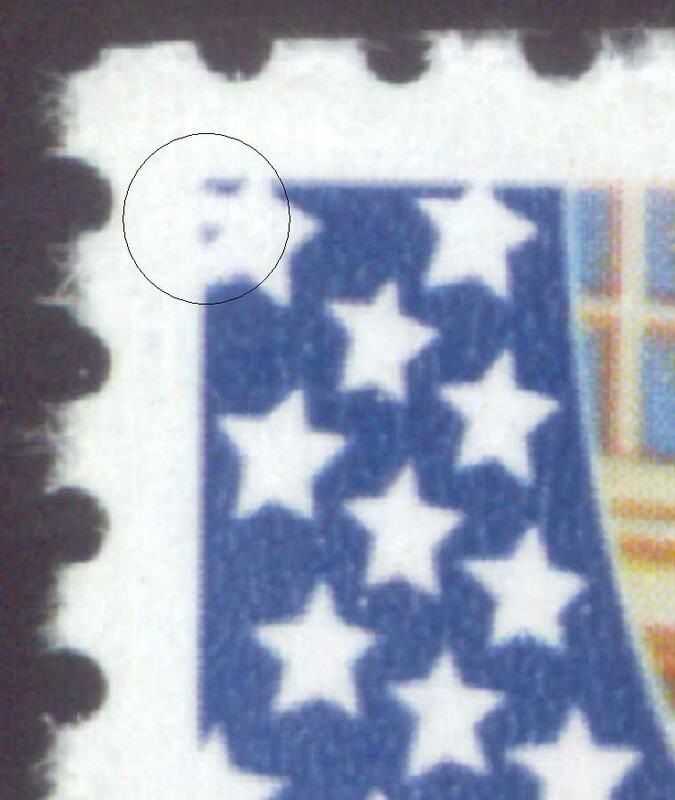 These two differences can very easily be distinguished with the naked eye, when placing the two stamps side by side. (See Figures one and two above). The photo on our home page is of the low gloss gum variety reprint from sheet S22222. When actually sorting these two varieties, it is best to use an eyepiece. Let's start with the low gloss variety. In the cropped picture (Figure 3) check the upper left hand star. Compare the top blue portion above the left hand point, and you will notice that the outline of this detail is quite blurry. Now check the blue triangle directly to the left of the two points, here the blue portion of the background is almost indistinguishable, and in some cases is non existent to the naked eye. Comparing the low gloss variety with the shiny gum variety is fairly simple. Check the same upper left blue triangles, as directed above, on the cropped picture (Figure 4), and you will see how sharp and clear these two triangles are. With a little practice, these two varieties can be sorted with the naked eye. However in some instances, it will be necessary to use the eyepiece. There is also a distinct difference in the thickness* and brightness of the paper used. The shiny gum variety is the brighter and whiter of the two, with the low gloss variety having a very slight beige tint to it. Happy hunting! 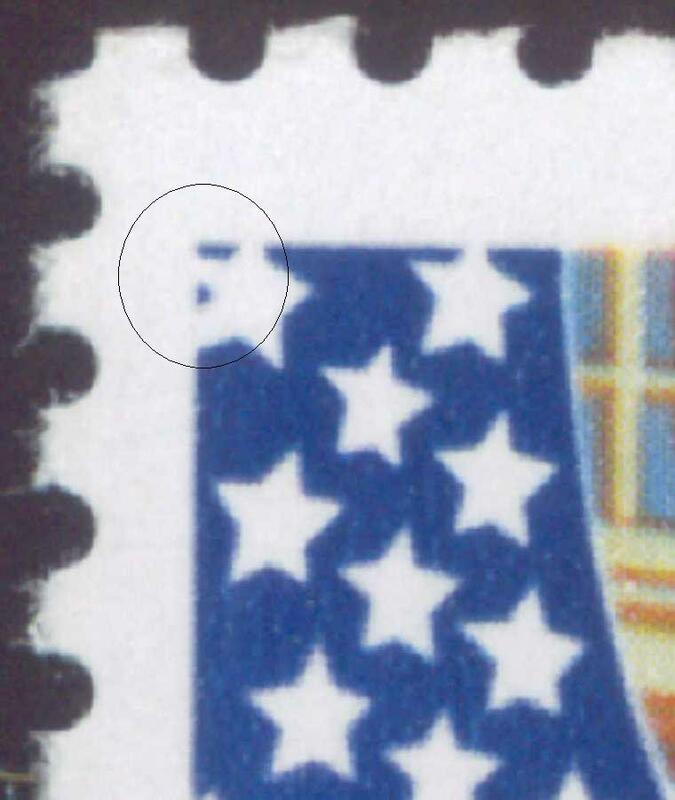 *Authors note: Information from USPS states the S11111 is the thicker paper, however upon having the stamps examined by several people, it appears that the S22222 is the thicker of the two. We are currently investigating this further to verify which is which. Thank you for your patience.